I said the next time I cooked up a spaghetti squash, I’d make alfredo sauce from scratch. So now, I decree: IT IS DONE! 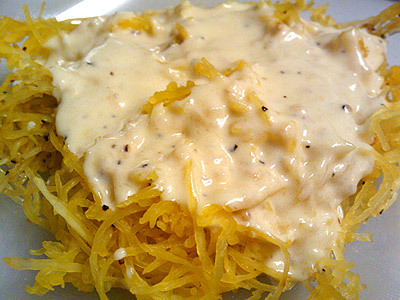 Spaghetti squash with alfredo sauce. Melt the butter in a small saucepan over medium heat. Then add the garlic and let it cook a bit in the butter. Add the cream and pepper, and stir or whisk until it’s all combined and simmering. Don’t boil it — cream is tender stuff. Add the cheese, stir/whisk again until it’s all combined. The xanthan gum isn’t necessary (it’s a low-carb fiber thickener); I worried about it being too thin. I didn’t need to worry — it turned out a little too thick, so it’d be perfect without. Next time, I use more garlic. This was good, but more garlic will make it great. 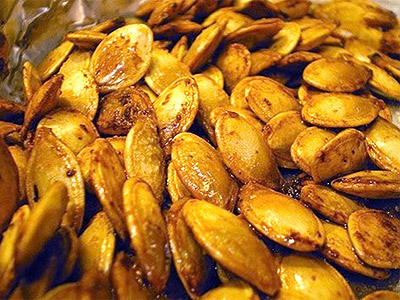 Also, did you know … you can roast spaghetti squash seeds just like pumpkin seeds? Granted, you don’t get as many seeds. Although I was impressed with just how many seeds I got. Throw them in the oven with a couple of tablespoons of butter at 300°, 45-50 minutes, stirring every 15 minutes or so. Pull them out, salt them up, and eat. 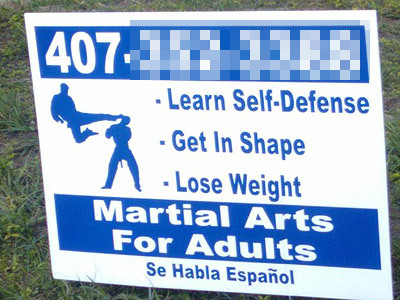 Last but not least, I pass by this sign on my way to work every day. Today I was lucky enough to be stopped at the traffic light right next to it, so I could take a snappy. I’m madly in love with the piece of clip-art they’ve used.